FORT WORTH, Texas (Dec. 7, 2017) – Oklahoma senior Baker Mayfield has been named the 2017 Davey O’Brien National Quarterback Award winner, becoming the third Sooner player ever to claim the nation’s oldest and most prestigious quarterback trophy. 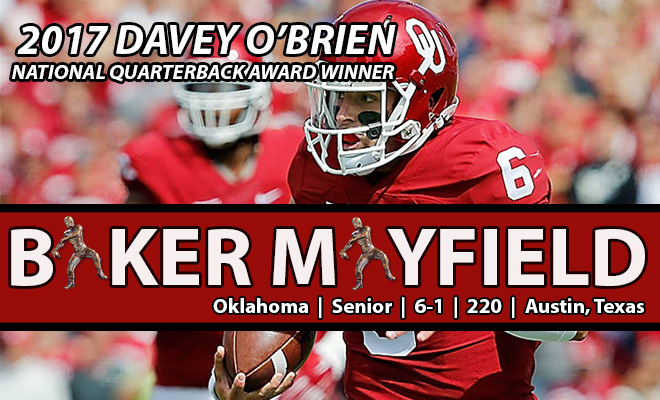 Mayfield joins Jason White (2003-04) and Sam Bradford (2008) as winners from Oklahoma. The Austin, Texas, product is the first recipient from the Big 12 Conference since Baylor’s Robert Griffin III in 2011. He is the eighth quarterback winner to star as a prep in O’Brien’s home state of Texas, joining Michael Bishop, Ty Detmer, Griffin, Johnny Manziel, Colt McCoy, Andre Ware and Vince Young. On the year, Mayfield is 262-for-369 passing for 4,340 yards and 41 touchdowns. He also has rushed for 310 yards and five scores. He leads the nation in passing efficiency (203.8), points responsible for (278), completion percentage (.710) and yards per pass attempt (11.8). Mayfield also ranks among the NCAA’s top five in passing yards (2nd, 4,340), passing touchdowns (2nd, 41), total quarterback rating (93.1) and total offense (4th, 357.7). In 2017, the senior has thrown for more than 300 yards eight times, including a school record total of 598 against Oklahoma State. Mayfield also has at least three touchdown strikes in five straight games, including a season-best five against the instate rival Cowboys. His passing efficiency rating currently is the best in NCAA history. The Big 12 champion Sooners own a 12-1 record and earned a berth in the College Football Playoff as the No. 2 seed. In the Big 12 Championship Game against TCU on Saturday, Mayfield completed 15-of-23 passes for 243 yards, four touchdowns and no interceptions. He also added 65 yards rushing on just six carries, and was named the game’s Most Outstanding Player. Including Mayfield, over the past 10 years, the Davey O’Brien Award winners’ teams have combined for an overall record of 127-13 (.907). He is the fourth straight winner to lead his team to the College Football Playoffs, joining Oregon’s Marcus Mariota (2014) and Clemson’s Deshaun Watson (2015, 2016). Two winners in the past five years ultimately claimed National Championships (Florida State’s Jameis Winston in 2013 and Watson in 2016). Ballots were tabulated from the Davey O’Brien National Selection Committee, which includes select media members and all former winners, and combined with the fan votes recorded at VoteOBrien.org, which accounted for five percent of the process. The other two finalists were Ohio State senior J.T. Barrett and Oklahoma State senior Mason Rudolph. Mayfield has the distinction of being the first-ever three-time finalist for the award (2015-17). He also was named the Davey O’Brien National Quarterback of the Week twice this season (Sept. 12 and Nov. 9) to give him a record five career honors. Mayfield, who also was named the AP Player of the Year on Thursday, is a finalist for the Heisman Trophy, which will be announced Saturday. 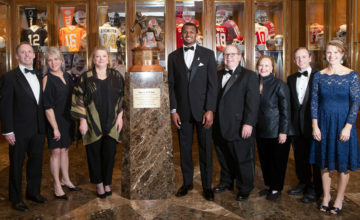 Five of the last seven players to win the Davey O’Brien Award—Cam Newton (2010), Griffin (2011), Manziel (2012), Winston (2013) and Mariota (2014)—went on to be awarded the Heisman Trophy. Dating back to 2006, eight of the 11 O’Brien winners also claimed the Heisman. Mayfield will be honored at the 41st Annual Davey O’Brien Awards Dinner on Monday, Feb. 19, 2018, in Fort Worth, Texas. The Davey O’Brien National Quarterback Award is presented annually to the nation’s best college quarterback and is the oldest and most prestigious national quarterback award. 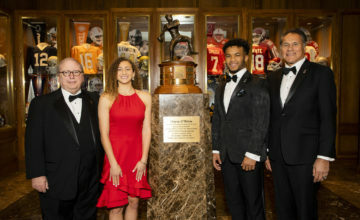 The Davey O’Brien Award honors candidates who exemplify Davey O’Brien’s enduring character while exhibiting teamwork, sportsmanship and leadership in both academics and athletics. The award is overseen by the Davey O’Brien Foundation, which is headquartered in Fort Worth, Texas, and has given away more than $1 million in scholarships and university grants to help high school and college athletes transform leadership on the field into leadership in life. For more information, visit www.DaveyOBrien.org. The 2017 Davey O’Brien winner will be honored at the 41st Annual Davey O’Brien Awards Dinner on Feb. 19, 2018, in Fort Worth. In 1938, TCU quarterback Davey O’Brien became the first player ever to win the Heisman Trophy, Maxwell Award and Walter Camp Award in the same year. He was inducted into the College Football Hall of Fame in 1955. O’Brien was drafted fourth overall in the 1939 NFL Draft and earned Pro Bowl honors in his rookie season after setting a National Football League record for season passing yardage. The NFL’s highest-paid player retired after the 1940 season to become an FBI agent. 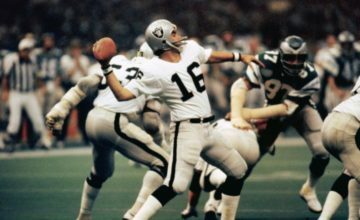 Previous National Quarterback Award winners include: Jim McMahon (BYU, 1981), Todd Blackledge (Penn State, 1982), Steve Young (BYU, 1983), Doug Flutie (Boston College, 1984), Chuck Long (Iowa, 1985), Vinny Testaverde (Miami, 1986), Don McPherson (Syracuse, 1987), Troy Aikman (UCLA, 1988), Andre Ware (Houston, 1989), Ty Detmer (BYU, 1990-91), Gino Torretta (Miami, 1992), Charlie Ward (Florida State, 1993), Kerry Collins (Penn State, 1994), Danny Wuerffel (Florida, 1995-96), Peyton Manning (Tennessee, 1997), Michael Bishop (Kansas State, 1998), Joe Hamilton (Georgia Tech, 1999), Chris Weinke (Florida State, 2000), Eric Crouch (Nebraska, 2001), Brad Banks (Iowa, 2002), Jason White (Oklahoma, 2003-04), Vince Young (Texas, 2005), Troy Smith (Ohio State, 2006), Tim Tebow (Florida, 2007), Sam Bradford (Oklahoma, 2008), Colt McCoy (Texas, 2009), Cam Newton (Auburn, 2010), Robert Griffin III (Baylor, 2011), Johnny Manziel (Texas A&M, 2012), Jameis Winston (Florida State, 2013), Marcus Mariota (Oregon, 2014) and Deshaun Watson (Clemson, 2015-16). American Airlines is the official travel partner of the Davey O’Brien National Quarterback Award.